The Federal University of Petroleum Resources Effurun, FUPRE 11th Matriculation Ceremony for Freshers/Newly Admitted Students for the 2017/2018 Academic Session. 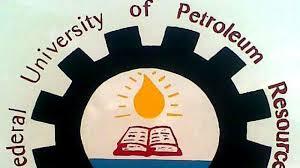 This is to inform all fresh students that the 11th Matriculation ceremony (2017/2018 academic session) of the Federal University of Petroleum Resources Effurun has been scheduled for Thursday, 5th April, 2018 in the University Main Auditorium by 10.00 a.m. prompt. Matriculating students should be seated at 9.30am. Participation in the matriculation exercise is compulsory for all duly registered fresh students of the University. Consequently, 100 level and 200 level Direct Entry students who have not registered with the Health Centre are advised to proceed to the Health Services Department for Medical Screening Exercise commencing on Tuesday, 3rd April, 2018. Please note that Medical Screening is an integral part of the registration exercise. Only students who have gone through the medical screening exercise will be issued with their Matriculation Numbers.